The biggest show in college basketball comes to the KFC Yum Center Tuesday night. Location: KFC Yum Center: Louisville, Ky. The No. 1 overall seed in the NCAA tournament selection committee’s bracket reveal over the weekend, Duke enters Tuesday night as the No. 1 team in Ken Pomeroy’s rankings and the No. 2 team in the NET and both major human polls. Led by national Player of the Year front-runner Zion Williamson, there’s little question that Duke is the most naturally gifted team in all of college basketball. Williamson is a near lock to be the No. 1 pick in this summer’s NBA draft, R.J. Barrett is just as safe a choice to be selected immediately after Williamson, and Cam Reddish will also almost certainly be taken somewhere in the top 10 of the same draft. A fourth freshman in the starting lineup, Tre Jones, is one of the top on-ball defenders in the country and also a likely first round pick. Duke sits near the top of the national rankings in virtually every major category outside of three-point shooting and free-throw shooting. They rank second in Ken Pom’s adjusted offensive efficiency rankings, and their average of 86.8 points per game is the fourth-best in Division-I. Where the Blue Devils have been a surprise this season has been on the defensive end. Despite relying heavily on four freshmen, Mike Krzyzewski hasn’t been forced to move from man-to-man to zone as he has in other recent seasons where one-and-done talents have played prominent roles. Jones is a tremendous on-ball defender, Williamson is an elite rim protector, and as a team, Duke leads the country in both steal percentage and block percentage. Their No. 5 ranking in adjusted defensive efficiency makes them one of just two teams (Virginia is the other) in America to rank in the top five of both AdjO and AdjD. We could dive deeper into the specifics if we wanted to, but what’s the point? If you’re reading this, you’ve probably seen these guys play multiple times, you know how good they are, and you know what Louisville’s up against tonight. STRENGTHS: Pure talent, elite athleticism, forcing turnovers, blocking shots, scoring around the rim, pressure defense, offensive rebounding, keeping opponents off the free-throw line, size, length. WEAKNESSES: Three-point shooting, free-throw shooting, getting to the free-throw line. —Louisville will be holding a “Black Out” theme for the Duke game. The team will be wearing black uniforms and fans attending are encouraged to wear black. —Duke is 5-0 in true road games this season, making them just one of two Division-I teams (Tennessee is the other) that has yet to taste defeat on the road. —When playing at home against the No. 2 team in the AP poll, Louisville is 6-0 all-time when ranked No. 16 or better. —Duke forces an average of 21 turnovers per game, the second most of any team in Division-I. —Duke head coach Mike Krzyzewski is 5-6 all-time in games against Louisville. —Jordan Nwora is the second-most improved scorer in the nation with his 17.6 scoring average (sixth in the ACC) up 11.9 ppg from his 5.7 average last year. —Duke’s RJ Barrett leads the ACC in scoring at 23.1 points per game. He is the fastest Duke freshman to reach 500 points (22 games), and the second fastest player in any season under Coach K to reach 500 points (J.J. Redick, 19 games, 2005-06). —Zion Williamson is second in the ACC in scoring at 21.8 points per game. He and Barrett are the highest scoring duo in the country this season at 44.9 points per game. —Barrett and Williamson are aiming to become the first freshman teammates in NCAA history to each average 20.0+ points in a season. —Louisville has a 46-13 record in conference home games over the last six years (.780). U of L has the fourth-most conference home wins in its five years in the ACC with a 31-10 ACC home record. —Christen Cunningham leads the ACC in assists in conference only games (6.4). He has handed out 55 assists with 15 turnovers in his last eight games. —Zion Williamson is the only player in the country averaging more than 20.0 ppg while shooting better than 65 percent from the field. —Duke is 6-1 against top 25 opponents this season. —Louisville is 4-4 against top 25 opponents this season. —This will be Chris Mack’s first game against Duke as a head coach. Mack was 2-5 against the Blue Devils during his time as an assistant at Wake Forest, and 0-1 against Duke as an assistant at Xavier. —Duke plays at the 18th-fastest pace in Division-I. —Despite hitting 13-of-21 three-pointers in its win over Virginia last Saturday, Duke is shooting just 32.0 percent beyond the arc as a team this season. That’s on pace to make this the worst three-point shooting team in the history of the program. —Louisville is 12-14 all-time against teams ranked No. 2 in the AP poll. 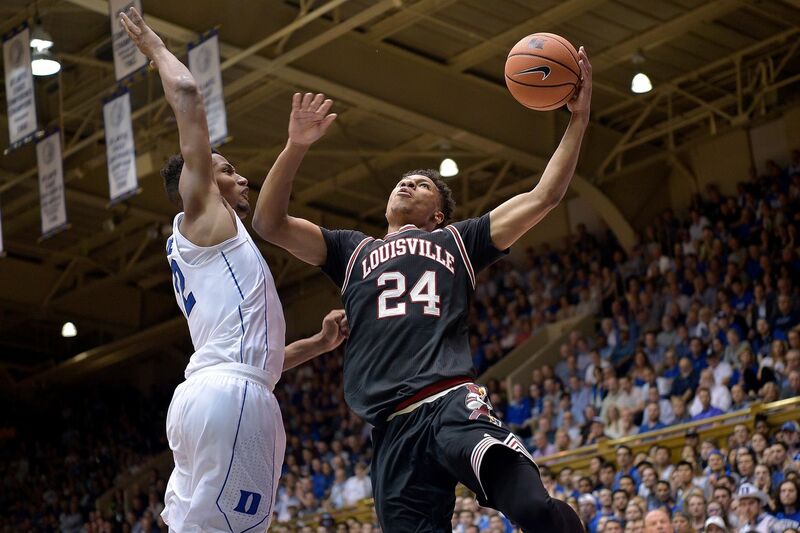 —Louisville is 3-2 all-time in home games against Duke, winning its last two games against the Blue Devils inside the KFC Yum Center. —Louisville is 19-12 all-time in games played on Feb. 12, winning four of its last five on the date. —Duke ranks fifth in the nation in offensive rebounding percentage, grabbing better than 38 percent of its own misses. —Duke’s reserves are averaging just 4.43 points per game during the Blue Devils’ current 7-game winning streak. —Louisville is 16-1 this season when shooting a better percentage from the field than its opponent, with its one loss coming last weekend against Florida State. —Louisville is one of just four schools which have won 20 or more games on the court in each of the last 16 seasons (also Kansas, Duke and Gonzaga).